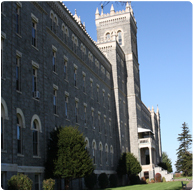 After 26 years of retreat ministry and more than 75 years as a major seminary, the Redemptorists will close Mount St. Alphonsus Retreat Center on January 1, 2012. The end of ministry at “the Mount” comes as the Redemptorists are reexamining their pastoral commitments in light of the increasing age of their members and the need to continue their primary ministry to the poor and most abandoned. Mount St. Alphonsus will continue to conduct retreats and to host weddings, conferences and receptions through the end of 2011. Mount St. Alphonsus was built between 1904 and 1907, and operated as the Redemptorist seminary until 1985 when the students were relocated to Washington, D.C. because of declining numbers. Future plans for the property have not been finalized.